Are you a mental health professional ready to open a practice, and don’t want to risk opening up an entire office on your own? Worried about committing for over a year when you’re not sure if you will have the clientele? Are you concerned about the headache of signing a lengthy lease with the building management? Not sure if you want to search for furniture, and spend the money on furnishing an entire office? Don’t want to start with taking a big risk? 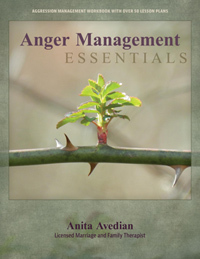 Not sure if you will be all alone as a therapist in your practice? No need to look any further. 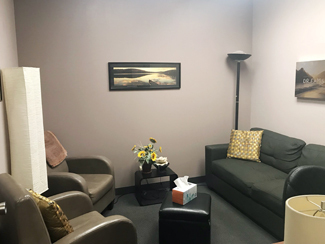 This is a part-time office space suitable for professionals who are in the mental health field, or the like, who either want only a part time practice, or are beginning a practice. There are two suites within this building. The building (Citibank Building) is located on the North East corner of Ventura and Sepulveda, across from the Sherman Oaks Galleria. It is a Class-A building. There are many nearby restaurants and stores, including 24-hour parking adjacent to the building. It is a secured building with a security guard present from 7 AM to 11 PM. Both spaces are ideal for new practitioners who are beginning to build their practice or for practitioners who would like to upgrade their space. 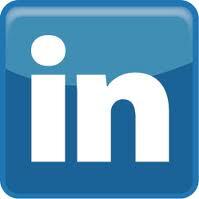 Both offices have a friendly atmosphere and are great for networking. 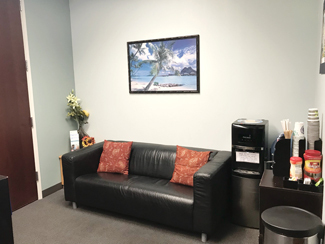 There is a directory for all the tenants of the two Sherman Oaks suites along with the Tarzana Office tenants. In addition, there is a networking event annually where the tenants of all three offices get together, and share about their practice. 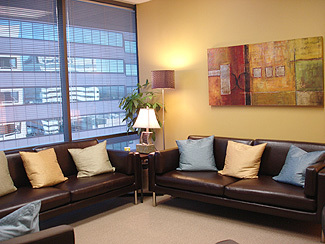 The 1101 Sherman Oaks suite is shared with a child and adolescent psychiatrist (full-time). The room for sublease is a large floor to ceiling windowed office. The walls are soundproofed to reduce any noise distractions. There is space for an assistant to work while you are using the office (additional charge). Office is tastefully furnished. Feng-Shui consultant assisted in the décor. Warm colors and an inviting atmosphere. 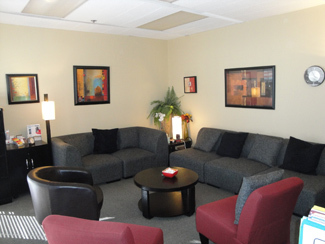 The large room is shared with a few therapists, including eating disorder specialists. This suite offers a separate exit, call lights for you to know that your client has arrived, and a refrigerator to store your food. has a Zen feel to it. It includes refreshments such as coffee, tea, water, and candy for your clients. The suite also has call lights in order to indicate that your client is waiting in the waiting room. Feng-Shui consultant assisted in the décor. 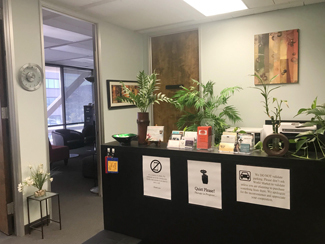 The Sherman Oaks Office space is shared by several tenants, including psychologists, neuro-psychologist, psychotherapist, nutritionist, and feng-shui consultant. The copier and fax is made available to all tenants. Wireless internet is set up at this suite. 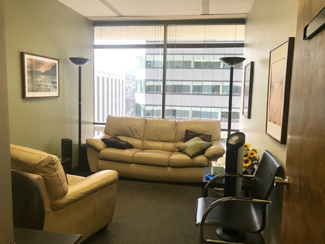 If you are interested in the Sherman Oaks Office space, please contact Anita at (818) 426-2495 or email her at anita@anitaavedian.com.